Park the car and it's ready - steady - go for the three scrambling monkeys. Awesome game of kick to kick along the dunes. Benji, all white hair and golden skin, blends right in. We climb. He gets creative. The creativity rubs off. Rikki and her own coloured palatte. Rainbow Beach on the Inskip Peninsula gives us our first uncongested view for weeks as we unhitch on the banks of a picturesque inlet. It also gives us a fresh perspective on how much the kids have grown, as we gaze with pride - and a good dose of self-congratulation - as they roam fearlessly... fishing on their own; conversing animatedly with grown-ups; taking themselves to the toilet; driving hard bargains when negotiating for movies or treats... We are a family of five now - each of us interesting, worldly and mature - and no longer just a couple, with three kids. Unfortunately Rainbow Beach also gives us our first taste of midgies, or rather, gives them a taste of us. These tiny, lethal, mosquito-esq insects feast on our bodies with zeal and we soon discover that the innocent looking red spots that dot our legs and arms will, all too quickly, flare up to become painfully itchy bites that take days... DAYS!!!... to disappear. In the groin of Australia's largest Ned Kelly en route to Rainbow Beach. Carlo Sandblow at Rainbow Beach, a football-stadium-sized cliff top of sand, and great place to tire the kids before dinner. Carlo Sand Blow is a para-gliders paradise, with an uninterrupted landing strip of sand. The day we are there, the gliders are dotted across the sky... kind of like the midgie bites that will, soon enough, be dotted across our bodies. Industrious Benji heads out, umprompted, to collect fire wood and drags his contribution back to camp. We do enjoy a good sing-a-long in the car to our Mary Poppins CD. Suffice to say, our vocal chords are in top form on our day trip to Maryborough, the town in which PL Travers, author of the 6-part Mary Poppins series, was born and raised before relocating to London. Poppins paraphernalia aside, the town also boasts an array of immaculate heritage homes, and a street market that - even for us seasoned marketeers - manages to offer up stuff that is new. A most splendid outing indeed. Throwing a bit of Bihary love Mary's way. A tempting offer outside a pub in Maryborough, but we decide that we have had enough of day care centres for one lifetime. Sam and her alter-ego, Captain Vegetable. Four hours out at sea on still blue waters beneath a cloudless sky, up close with humpback whales. It's somewhat of a rite of passage for travellers to Hervey Bay to join a whale watching cruise and with only two days left in the whale watching season, we manage to just scrape in. Having attempted to spot a whale since pulling into the Head of Bite waaaaaay back when crossing the Nullarbor - with no success - we are reassured to see that the cruise gives an iron clad guarantee that we will see one. But we don't see one. It is absolutely, unequivocally marvellous. Mind you, the children do tire of the whole "Eye Spy The Biggest Mammal In The Sea" game after about half an hour and replace it with their own game of "Let's Go Raid The Cake And Cookies Buffet Again When No One Is Looking"... but that only leaves mum and dad together on deck to enjoy the whales on their own. This, a rare gift in itself. Thank you whales. Thank you Hervey Bay. Our four hours of whale watching whiz by waaaaay too fast and we relish every single minute. Heading out to sea, boardies billowing in the wind. Our jaws drop open at the sight of the first whale up close and don't slam shut again until we are back on shore. Two whales side by side. Hard to time the photos to capture them when they emerge, but its easy enough to see their outline beneath the water. A very solumn-faced Jack feeling like he is about to vomit. From too much happy buffet. Located right beside the beach and with a water park next door, we are easily enticed into a five day stay at Hervey Bay. Two days are taken up with day trips (one, to search for whales; the second, to search for Mary Poppins) and the other three zip past in a mix of walks, rides, books, newspapers, surfs and swims. Fraser Island beckons from across the sea, but we decide to raincheck any free-camping plans for a later date, when the kids are older and the parents are feeling ... well, more energetic. * Rikki cannot go past an op shop or market stall without adding to her stuffed animal collection. She now has a zoo living at the foot of her bed. * Jack cannot fall asleep without the airconditioner turned to high, regardless of the temperature outside. Entering the caravan at night is akin to stepping inside an industrial freezer room. * Benji's inclination to call it quits at the tail end of long hikes, sit himself down and refuse to move, has morphed into an everyday habit. Every outing, however short, is fraught with peril. He has, however, redeemed himself somewhat by learning how to wipe his own bottom after doing Number Twos. * Sam has developed a shooting RSI-esq injury in one foot. The likely suspect? Flat footed sandals that she has worn, non stop, for eight months straight. Time to rotate those glass slippers, Cinderella! "Can we watch a movie tonight..."
"What are we having for dinner..."
"Can we get a treat..."
"Can you turn the air conditioner on..."
"What are we doing after breakfast..."
"What are we doing after lunch..."
"What are we doing after dinner..."
"How long til it's the morning..."
"When are we going to get there!!!" Other phrases that seem to get a daily workout include "CAN I TELL YOU SUMFING?" and the all-time-classic (can't-believe-they-have-the-chutzpah-to-think-it-let-alone-say-it-aloud-after-getting-this-gift-of-a-year-away-don't-they-know-how-lucky-they-are-I-cannot-believe-what-I-am-hearing-here-they-go-again-it-is-unbelievable) "I'M BORED!". On a positive note, though, we have taught everyone to say a pre-emptive "Excuse Me" when they fart. 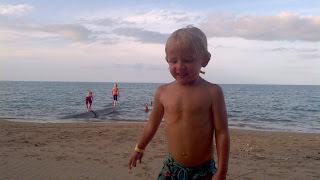 Jack bravely conquering the wave pool. His siblings, who don't make the height limit cutoff, are resigned to watching from the wings. Hanging out in Hervey Bay. A beach, warm waters and an exposed pipe. 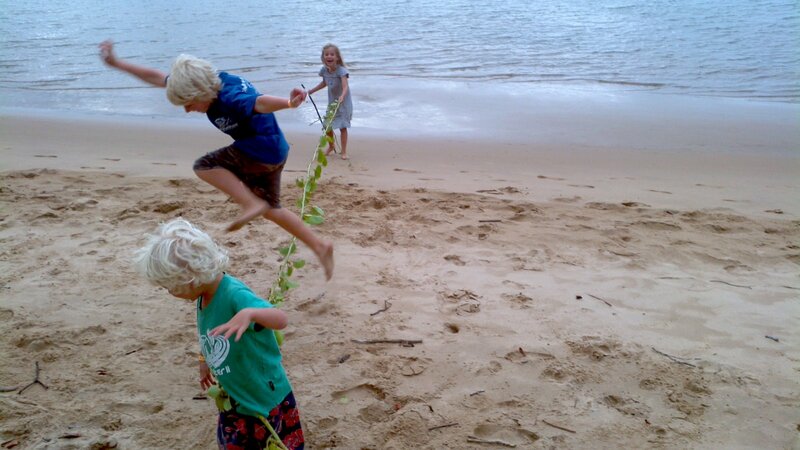 The Hervey Bay formula for fun. Bundaberg is famous for Bundaberg Ginger Beer and Bundaberg Rum. Which was always going to make 4 out of 5 Biharys very happy, and meant that our arrival in "Gingerberg" (thank you wordsmith Benji) has been counted down eagerly for weeks. Our first day sees us scooting out of town to nearby Gin Gin to catch the rodeo, but after that it's Bundy time all the way. Certainly there are some decent markets to explore (and we do), but the undisputed highlight of our visit - of course - are the Ginger Beer and Rum factory tours... and the undisputed highlight of the tours - of course - are the free drinks at the bars at the end. For our H2O household, it is a sugar rush of unprecedented, unrestrained proportion. Who would've thought there were so many flavours of soft drink, much less of rum! It's fair to say that by the time we leave town we have drunk enough to offset 7+ months of good eating - and dispel any illusion that the ginger in ginger beer makes it a health food. We have, however, done ourselves proud in mastering our own versions of the mighty bunda-burp. Enjoying our first four-pack of Bundaberg Ginger Beer in the park. Budge behind the bar. Wearing his own drinks card and holding onto Miss "no-thanks-I-don't-drink" Sam's, which does - you betcha - entitle him to twice the number of drinks as the other adults on the tour. Forteen flavours at the Ginger Beer factory, which have to be sampled in order and in their entirety. It does not get any better than this for the bubbly Biharys. A lateral attempt to get the kids to burn off some of that soft drink sugar with a game of boom-gate limbo back at the caravan park. Sure we've seen bulls, horses, big belt buckles and cowboy boots before. But never so many in one place and never - ever - like this! The rodeo in the town of Gin Gin is an annual event and about the only compelling reason we had to drag ourselves away from the town of 1770. Luckily, no regrets! The rodeo is our entry ticket into an Aussie Cowboy Sub-Culture - and it proves to be every bit as wild and wonderful as we'd hoped. So for one long lazy afternoon, we cut loose with the cowboys. From the safety of the stands, we watch riders get thrown from bucking bulls, cheer the rodeo clowns who come to their rescue, marvel at the skills and ages of the horse riding competitors, and hum along to the Country n' Western tunes belting out. We may be dressed in shorts and sandals on the outside, but on the inside we are decked out in our very best denim jeans and freshly ironed plaid shirts, boots polished and belt buckles shining. Just like everyone else. Yeee-hah! The little town called 1770 was named after the year (and place) in which Captain Cook made his second landing in Australia after Botany Bay. We arrive much later in the afternoon than planned after a collision on the road ahead brings traffic to a standstill for over an hour and a steady series of roadworks means we never quite pick up speed again after that. But the rains clear as we pull into 1770 and don't come back until the next morning - so our overnight stay, albeit brief, nonetheless manages to give us a hearty taste of all that 1770 offers. What an absolute hidden gem it turns out to be! Swimming, fishing, sailing, campfires, ocean views, bush walks, bike paths, boardwalks, playgrounds, tropical trees, serviced camp grounds... 1770 ticks all the boxes and we are reluctant to leave. But we have a rodeo rendezvous to make, so we say our sad goodbye and bookmark the place for a return visit with friends and family in tow. The traffic jam we get stuck in. Banked up cars stretch ahead for about a kilometre, but there is no alternate route and we can only stick it out. Luckily the truckies up ahead are giving regular progress reports on the CB radio. Luckier still, the kids are immersed in a DVD in the backseat and have headphones on, because the reports are peppered with swear words, dirty jokes and commentary on every passing sheila. The beach at the camping grounds, butted up against a national park. Impromptu game of rope-skip using seaweed on the beach. This town just inspires creativity! As seen in the Camp Kitchen at our caravan park in Yeppoon. We'll add it to our daily prayer for good weather. In Yeppoon we are bombarded with fierce winds and intermittent rain. But we are glad to be down HERE, because in Cairns, Cape Trib, Mission Beach.... all the places we have just been... there are BIG BIG floods a'happening. So we tour Yeppoon and neighbouring Rockhampton and Emu Park from the safety of the car; not much to see, though Rocky does score some points for the historic city buildings by the river and enormous hanging-root trees in the park. Our bronzed bodies now hidden beneath pants and hoodies, we drive on, keeping the floods at bay and desperately praying for the return of our beloved sun. The ocean is choppy and grey in Yeppoon. THOSE fabulous trees, in Rockhampton. The Singing Ship in Emu Park, a memorial to Captain Cook's visit. Today the ship is singing VERY VERY loud. We complete our second longest drive yet to get from Airlie Beach to Yeppoon - seven hours down the Bruce Highway from 8am until 3pm (sandwiches made en route without stopping). Just after we leave Townsville we encounter a road sign that pre-empts the chorus from the backseat by nanoseconds: "ARE WE THERE YET?". The laconic aussie wit continues for kilometres, with a series of road signs well placed to keep us awake... and giggling. Airlie Beach is the launching point for the Whitsundays. We have our first rainy day since Kalbarri in WA (a novelty! ), followed by our second rainy day (an ominous sign of things to come..! 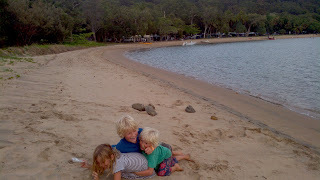 ).With sailing, fishing, snorkeling and bushwalking all scrapped from the agenda, we squeeze in some swims and drive-by tours of the area before the rains really descend, then the kids busy themselves with board games while we take the time to map out our itinerary for the next three months. Not quite the view of the Whitsundays that we'd envisaged. To the kids' delight, the swimming pool in Townsville is even better than the one ruefully left behind in Mission Beach. But our research indicates that there are more ahead that will up the ante even further. So - after an overnight stay in which we manage to cram a visit to the Esplanade water playground, trips to the health food superstore and the weekend markets, and a twilight drive to the city lookout (that is atop a hill just 8 metres shy of the 300 metres needed to qualify as a mountain - and so puts on a pretty convincing impersonation of the view from an aircraft coming in to land) - we hit the road again, eyes peeled for more pool slides, cheap fruits and sandy shores. At the water playground on the Townsville Esplanade. Hands up who loves this pool. Thanks J-Man! Mission Beach is an absolutely gorgeous 14km stretch of pristine golden sand flanked by towering palms and with a scattering of small islands dotting the horizon. Unfortunately the swimming pool at our caravan park has a waterslide. And as far as the Bihary kids are concerned, the slide trumps the beach, any beach - and heaven help the poor fool (or is that "pool fool"?) who tries to drag them away. So our two days in Mission Beach are spent mostly by said pool (including a special illuminated night-time swim), though we do slip in some beach walks and one unexpectedly stressful trip into town where a bookshop owner, who re-opens her store to let us browse, then trips and sustains a very bloody, very gruesome cut to her forhead. We return to the pool post haste. Final stretch of the banana-full Canecutters Way. Finally dragging ourselves away from the pool to the beach - just in time to see the wind pick up, the temperature plummet and the sun completely disappear. At the almighty alrighty swimming pool and slide.